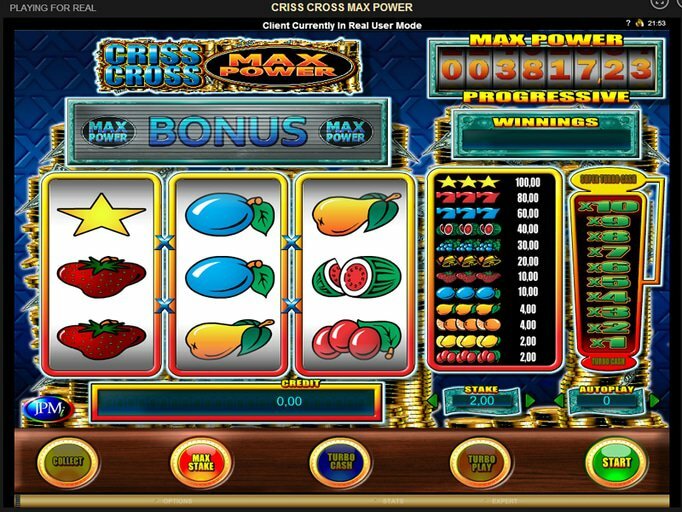 For those who love the three-reel classics but who are looking for something a bit more adventurous, the Criss Cross Max Power slot machine is the perfect opportunity. It only has the three reels but whereas most only have a single payline, this one features a whopping 27 - and that's more than most of the newer modern video slots! It has a classic machine theme and has fruit symbols to keep with the traditional style, though the addition of the Max Power icon brings with it new opportunities to win. Something that might be a bit surprising about this title is the fact that the jackpot has the potential to climb to 500 coins that can be gambled for a 20x multiplier! You'll be able to bet anywhere from a quarter to $10 to get started, and this is only the beginning of the fun. At first, it seems like any other classic game in which you'd try to line up symbols in the middle, but that's far from true. There are 27 ways to win, and after each one you'll be given the opportunity to participate in the One Up, One Down Gamble feature that will allow you to win up to 10x what you bet - and as much as 20x your bet with the Super Turbo Cash feature. What's more, if you get three of the Max Power symbols on any of the paylines, you'll open up the associated window that features a slider bar with stake multipliers. The revealer will stop at random and tell you how much of the progressive jackpot you've won, and this amount fluctuates based upon factors like the size of your bet and the time since it was last hit. The Orange symbol on the slider is what you'll need to win its maximum value. If you're interested in giving this unique title a go, then you can go to Gaming Club Casino where you'll get some Criss Cross Max Power free spins just to check it out! Then, to reward you for creating your account, you'll get access to a 100% deposit match worth up to $350 accompanied by 30 more free spins on their Mad Hatters game!